Sage 50 Quantum Manufacturing Edition 2018 streamlines your business and gets everyone working together as one team! The challenges of getting your business functions working as one are felt all the way down to the customer experience � and that can be costly. You may be better served by a scalable solution that integrates accounting and manufacturing functions so you can easily control your manufacturing inventory, effectively plan your purchasing and production activities, and provide accurate accounting results � within your own budget. Sage 50 Quantum Manufacturing 2018* is the ultimate, high-performance Sage 50 accounting solution that's designed to meet your changing needs with features that help improve internal communications and collaboration; provide better, faster customer service; and keep information secure. MISys SBM pays for itself by helping you reduce your inventory holding costs, avoid painful purchasing mistakes, and prevent costly production delays. 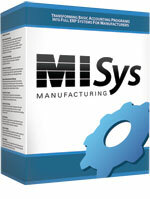 No other manufacturing system offers such dramatic return on your investment. See our Quantum Manufacturing Customer Success Story! Each module adds the functionality to Sage 50 Quantum you need to control your manufacturing inventory and to effectively plan your purchasing and production activities. Computerized Business Associates is a Sage 50 MISys Certified Consultant. to answer all your Sage 50 Quantum Manufacturing questions.